The quality of your sales presentation will often determine whether a prospect buys from you or one of your competitors. However, most presentations lack pizzazz and are seldom compelling enough to motivate the other person to make a buying decision. These seven tips will help you create a sales presentation that will motivate buyers. 1. Make the sales presentation relevant. 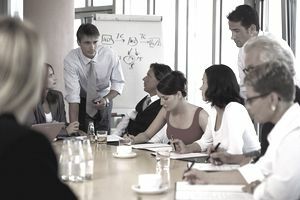 The discussion of your product or service must be adapted to each person; modify it to include specific points that are unique to that particular customer. This means researching your customer beforehand and becoming familiar with their business and the industry that they operate in. Check their business web site or Facebook page and peruse newsletters, blogs, annual reports and other relevant information. Research their competitors and if possible tailor your presentation to demonstrate how your product can help them gain a competitive advantage. If you use PowerPoint or other presentation software, place the company’s logo on your slides and describe how the key slides relate to their situation. Show exactly how your product or service solves their specific problem. This means that it's critical to ask your prospect probing questions before you start talking about your company. 2. Create a connection between your product/service and the prospect. In a presentation to a prospective client, I prepared a sample of the product they would eventually use in their program. After a preliminary discussion, I handed my prospect the item his team would be using – instead of telling him about the item, I placed it in his hands. He could then see exactly what the finished product would look like and examine it in detail. He was able to ask questions and see how his team would use it in their environment. Also, remember to discuss the benefits of your products, not the features. Tell your customer what they will get by using your product versus your competitors'. Today’s business people are far too busy to listen to long-winded discussions. Know what your key points are and learn how to make them quickly. I remember talking to a sales person who rambled at great length about his product. After viewing his product and learning how much it would cost I was prepared to move ahead with my purchase. Unfortunately, he continued talking and he almost talked himself out of the sale. Make sure you know what key points you want to discuss and practice verbalizing them before you meet with your prospect. Do not interrupt or argue with a customer! If you are making a presentation to a group and the discussion veers off topic, try to gently nudge the conversation back on track. The majority of sales presentations I have heard have been boring and unimaginative. If you really want to stand out from the crowd make sure you demonstrate enthusiasm and energy. Use your voice effectively and vary your modulation. A common mistake made when people talk about a product they are very familiar with is to speak in a monotone - causing the other person to quickly lose interest in your presentation. I recommend using a voice recorder to tape your presentation. This will allow you to hear exactly what you sound like as you discuss your product. I must profess to being completely humiliated when I first used this tactic. As a professional speaker, I thought all my presentations were interesting and dynamic – I soon learned that my stand-up delivery skills were much better than my telephone presentation skills. In The Sales Advantage, an example is given of a vending sales person laying a heavy sheet of paper on the floor, saying, “If I could show you how that space could make you some money, would you be interested?” Consider the impact of this approach compared to the typical approach of saying something like, “We can help you make more money.” What can you do to incorporate some form of showmanship into your presentation? 6. Use a physical demonstration. A friend of mine sells sales training; he often uses the whiteboard or flip chart in the prospect’s boardroom during his presentation. Instead of telling his client what he will do, he stands up and delivers a short presentation. He writes down facts and figures, draws pictures, and records certain comments and statements from the discussion. This approach never fails to help his prospect make a decision. 7. Lastly, believe in your product/service. Without a doubt, this is the most critical component of any presentation. When you discuss solutions, do you become more animated and energetic? Does your voice display excitement? Does your body language exhibit your enthusiasm? If not, you need to change your approach. After all, if you can’t get excited about your product, how can you expect your customer to become motivated enough to buy?